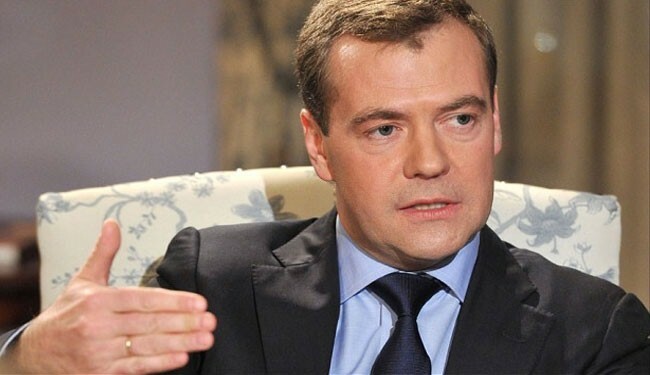 JNN 29 May 2014 Moscow : Russia’s Prime Minister Dmitry Medvedev has threatened to replace US dollar with Russian ruble as its currency for global trade, citing US-led Western sanctions against Moscow over Ukraine tensions. “Trading for rubles – this is a definite priority,” Medvedev said in an interview published on Saturday. “This, in fact, should ultimately move the ruble from the cohort of freely convertible currencies into the ranks of reserve currencies,” the premier added. The Russian government is reportedly considering plans to oblige state-owned companies to receive payment for key exports in rubles, rather than in dollars as at present. “Of course, the more we sell, for example, our products, including oil, gas, machine-building, defense products for rubles, the more we will encourage such a quality for our currency,” Medvedev said. The United States and its Western allies accuse Russia of destabilizing Ukraine and have slapped a number of sanctions against Russian and pro-Russia figures. Russia, however, rejects the accusation, saying the pro-Russia protests in Ukraine began spontaneously against the new government in Kiev. Tensions between the two countries heightened after Crimea declared independence from Ukraine and formally became part of the Russian Federation following a referendum in March. Russia has warned that it will take retaliatory measures if the West continues its policy of sanctions over the crisis in Ukraine. This entry was posted in Europe and tagged Dmitry Medvedev, Dollar, Hegemony, Petro Dollar, Putin, Ruble, Russia, Russian Ruble, Ukraine, western sanctions. Bookmark the permalink. ← Malala – Daughter of the Nation OR the Agent of the West ?